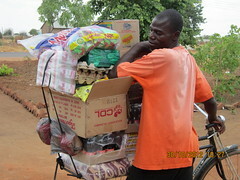 Yesterday (10/6/12) was a momentous day for the ColaLife Trial in Zambia (COTZ). 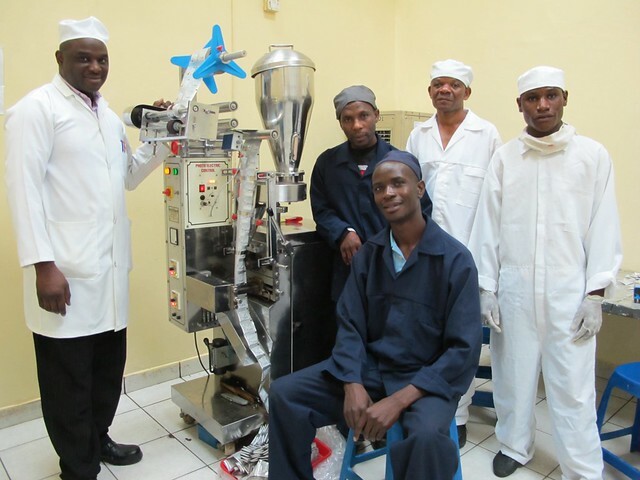 The first ever 4g sachets of ORS to be produced in Zambia came off a successfully modified machine at Pharmanova. 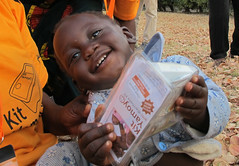 At last, people looking after children in Zambia – in the trial areas initially – will have access to an ORS sachet designed specifically for home use. 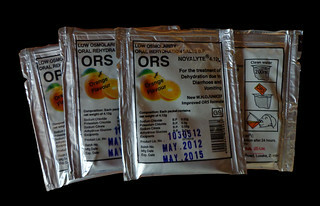 One that makes 200ml (a glass full) of ORS solution at a time – not a whole litre. It is incredible to me that this is the first time this has been done in Zambia. In a previous blog post I explained the compelling reasons for making smaller sachets. That’s John Chintu on the left who headed the operational team; behind him (but not in the picture) were Al Murugappan and Rakesh Shah. These guys have really got behind ColaLife despite the fact that we are such small fry compared with the scale of their business. The production of the small sachets has involved a lot of of work and coordination. My artwork for the sachets had to be sent to the foil manufacturers in India. New parts had to be specified for the sachet packing machine and these were also manufactured and imported from India. These parts were fitted but needed some adjustment on arrival. The minimum order for the foil was HUGE – much more than we will need for the trial, but Pharmanova ordered it anyway as part of their commitment to the trial. Hopefully, the trial will be successful and the foil will be put to use in a roll-out – but we are not there quite yet. The sachets produced yesterday will now go into a stability testing process which will take 3 months and then we will be able to start the trial. We do not expect any problems with stability as we are using an already approved ORS powder – we are just packaging it in smaller sachets. While this is happening, the rest of the foil is making its way to Zambia by sea. The videos below show the machine and team in action. The first one features me trying to explain the process. Note that for this small run the sachets were being weighed to check that the variation in weight was within acceptable limits. It was. And the batch number and manufacturing and expiry dates are being stamped on by hand. This will be automated when we turn to full production. Anyway, a huge ‘thank you’ is due to Pharmanova for their support and for getting us to this stage on time. This is great news. The beginning of great achievements. Keep up the spirit.